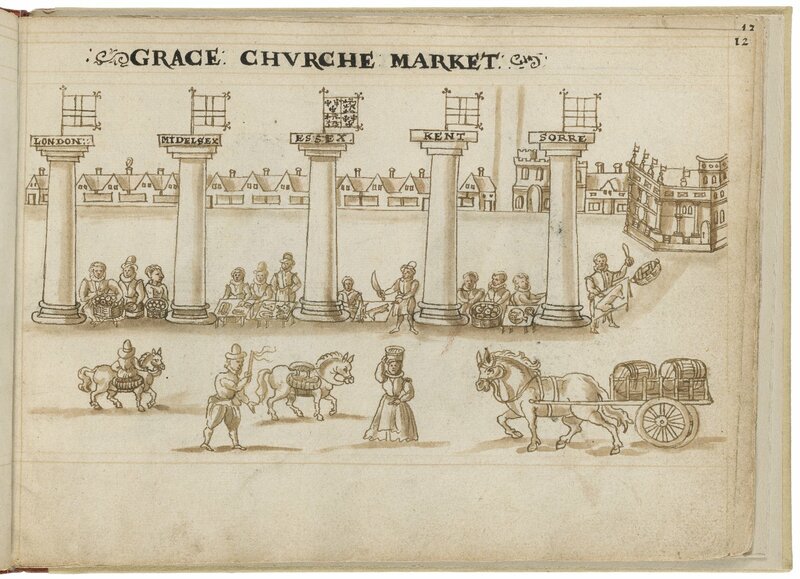 Drawing of Gracechurch by Hugh Alley. Image courtesy of the Folger Digital Image Collection. Gracechurch or Gracious Street was a late Anglo-Saxon street. It seems to have been built around the same time as London Bridge (tenth or eleventh century), to which it provided access. When the Burbage brothers (Richard and Cuthbert) dismantled the Theatre at Christmas 1598 in order to rebuild it as the Globe in Southwark, it is very likely that they brought the timbers on carts from Shoreditch down Bishopsgate Street, Gracechurch Street, and New Fish Street, and thence across the Thames to their new property on the south bank of the Thames just west of the bridge. Gracechurch Street was on the royal processional route. When a king or queen entered the City from the Tower, he or she stopped in Gracechurch Street to witness the first of a series of pageants prepared by London to welcome the new monarch. Jenstad, Janelle. Gracechurch Street. The Map of Early Modern London, edited by Janelle Jenstad, U of Victoria, 20 Jun. 2018, mapoflondon.uvic.ca/GRAC1.htm. Jenstad, Janelle. Gracechurch Street. The Map of Early Modern London. Ed. Janelle Jenstad. Victoria: University of Victoria. Accessed June 20, 2018. http://mapoflondon.uvic.ca/GRAC1.htm. Jenstad, J. 2018. Gracechurch Street. In J. Jenstad (Ed), The Map of Early Modern London. Victoria: University of Victoria. Retrieved from http://mapoflondon.uvic.ca/GRAC1.htm.